April Fool: Girl with Shopkeeper, a Norman Rockwell painting, appeared on the cover of The Saturday Evening Post published April 3, 1948. This is another favorite of Rockwell collectors, a classic enduring image of the world Rockwell painted. An alternate title is April Fool 1948. This painting was Rockwell's 253rd overall out of 322 total paintings that were published on the cover of the Saturday Evening Post. Rockwell's career with the Post spanned 47 years, from his first cover illustration, Boy With Baby Carriage in 1916 to his last, Portrait of John F. Kennedy, in 1963. This was also the third cover for The Post in 1948. In 1948, there were seven Norman Rockwell Saturday Evening Post covers published. The original oil on canvas painting is part of a private collection. on page 178 of Norman Rockwell, A Definitive Catalogue by Laurie Norton Moffatt. In this painting, Norman Rockwell answers his critic with a dose of total inaccuracy. Without fail, whenever a Rockwell painted cover appeared on The Saturday Evening Post, letters would come forth from the public decrying this or that error in the painting. Apparently this irritated Norman Rockwell. He meticulously researched and arranged his compositions to reflect total accuracy in all known elements of his paintings. Well, the April Fool series of paintings (this was the third and final installation) was his tongue-in-cheek answer to those critics and detractors. He purposely inorporated incongruities into all these paintings. April Fool: Girl with Shopkeeper was only one of 322 Norman Rockwell Saturday Evening Post covers; Here is the list of Norman Rockwell Saturday Evening Post cover illustrations. How many "mistakes" can you spot? 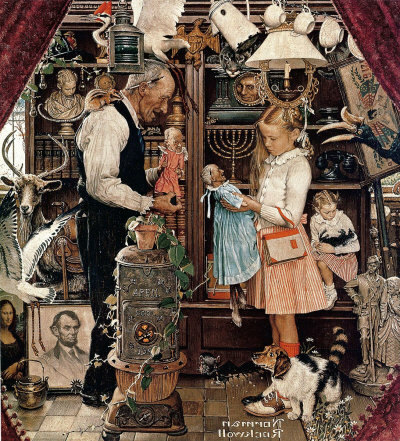 Click here for Rockwell's own list of errors from the 1948 April Fool's painting Girl With Shopkeeper. See the other paintings in the April Fool's series, 1943's April Fool's: Checkers and 1945's April Fool's: Fishing. Do You Have A Great Story, Opinion Or Contribution About April Fool: Girl with Shopkeeper?